Early in the morning of Wednesday, June 18, the Miniature Electric Staff (MES) system of safeworking in operation between Kiama and Bomaderry was suspended and replaced with Pilot Staff Working (PSW) to permit the miniature electric staff instruments to be removed, with the system of safeworking to be replaced with Rail Vehicle Detection (RVD). This would be the final step in replacing all MES sections on the Sydney Trains (formerly RailCorp) suburban and intercity network. This is not the final MES section of track in NSW however, with Goobang Junction (Parkes) to Dubbo via Narromine and Troy Junction (Dubbo) to Merrygoen still working under MES. Another long standing section of MES working was between Cootamundra West and Stockinbingal, however this was replaced by RVD only a couple of days prior to the Kiama to Bomaderry works commencing. Miniature Electric Staff was once the main system of safeworking over the single track section between Unanderra (south of Wollongong) to Bomaderry. Instruments were provided at Unanderra, Dapto, Albion Park, Dunmore, Bombo, Kiama, Berry and Bomaderry. This system of safeworking was slowly replaced with RVD as electrification crept south of Wollongong (1993 – Coniston to Dapto and 2001 – Dapto to Kiama). 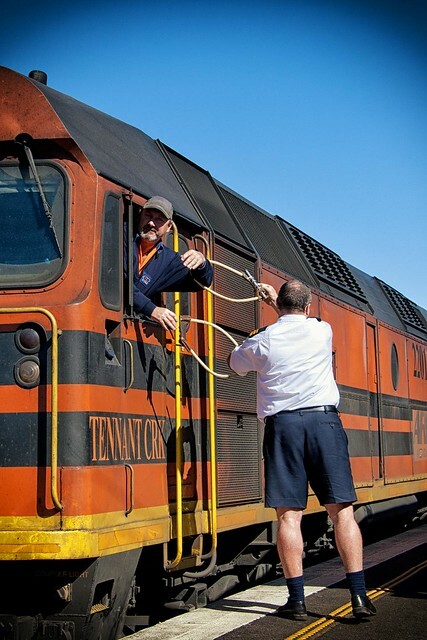 The driver of 2201 “Tennant Creek” exchanges the staff with the station attendant at Berry in 2008. One would be forgiven for thinking that they had stepped back in time when travelling beyond Kiama. 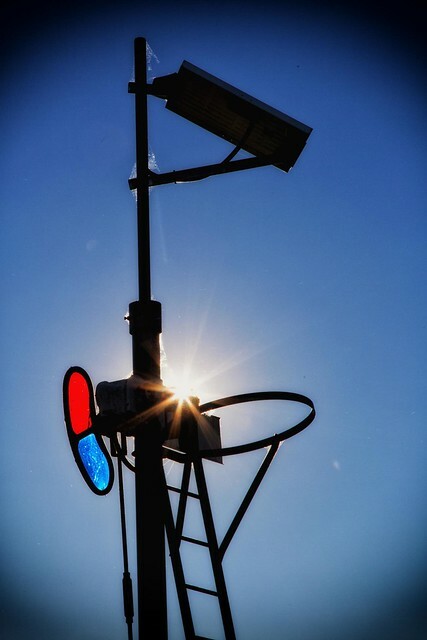 A world of colour light signals, overhead power supplies and double deck interurban trains gave way to telegraph wires, semaphore signals and mechanical point lever frames! These simple features, so close to Sydney and at the end of one of the four main lines feeding the Sydney rail network were always somewhat of an anachronism, especially as other similarly dated items faded away, from the 620 Class railmotors to the aging fleet of 422 and L Class locomotives used by Australian Railroad Group to service the Manildra Group flour mill at Bomaderry. By 2014, other such relics including main line semaphores and Block Telegraph working on the Main Southern line had been replaced with colour light signals and RVD under ARTC, and similar MES systems on many branch lines around the state had been superseded by Train Order working by John Holland. One could almost have been forgiven for thinking that the Kiama to Bomaderry section would remain unspoiled by the passage of time, a reminder of years gone by. For those who don’t understand MES working, it is a very effective, yet very simple of working a single line section, a development of Ordinary Train Staff & Ticket (OTS), the system that preceded it. OTS working involves a token for a section, and a book of tickets. To enter a section of track, a driver must be in possession of the staff, or they must sight the staff and be in possession of a ticket (this was to allow following movements). MES working involves two MES instruments at either end of a section of track. Each instrument has a number of tokens (staffs) in the instrument. To permit a train to travel through the section, a staff must be removed from the instrument and given to the train driver. This is the authority to proceed through the section. 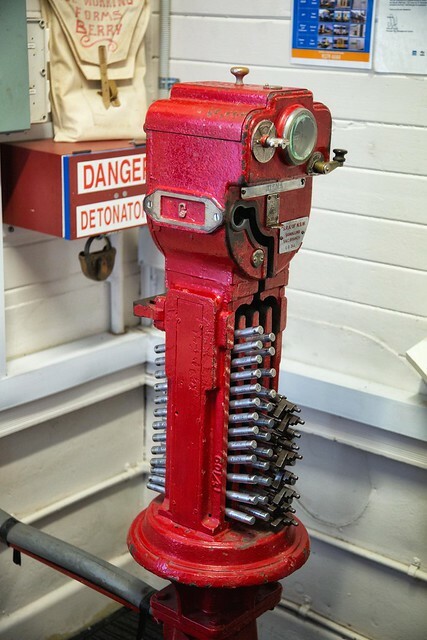 A staff can only be removed from the instrument if the signallers at either end of the section allow it, and if no other staffs have been removed from either instrument. After the train has traversed the section, the driver will hand the staff to the signaller who will then place the staff in the instrument at their end. This then allows another staff to be removed at either end, either for a following movement, or an opposing movement. Provided the correct procedures are followed, it is a simple system for ensuring only one train is in a section at any given time. Miniature Electric Staff Instrument for the Berry to Kiama section at Berry. Photographed with permission. A southbound train would arrive at Kiama and collect the staff for the Kiama to Berry section from the station attendant. Upon clearance of the signals, this would authorise the driver to work his train south to Berry. At Berry, the driver would surrender the staff for the Kiama – Berry section, and collect one for the Berry – Bomaderry section. At Bomaderry, the driver would again surrender the staff which would complete their journey. Berry was quite likely the last place in the state in which running staff exchanges could be performed and witnessed. Traditionally this was done by freight traffic during daylight hours, which passed through the station whilst it was staffed, and prevented the need for these heavy trains to stop and start again. A running staff exchange is performed using hoops to transfer the staff between train and staff member. This practice was later stopped, likely due to the risk of injury from the hoops if one staff member did not release it fast enough. Towards the end of MES working on this section of track, all trains were required to come to a stop to permit safeworking duties to be carried out. Whenever Berry was unattended (overnight), freight and passenger trains would have to work themselves through the section, with train crew required to operate the electric staff instruments themselves, and clearing the appropriate signals (and activating the nearby level crossing warning equipment). Crosses at Berry (in which a northbound and southbound train need to pass each other) were always an interesting occurrence. The passing loop opposite the platform had long been booked out (indeed, in 2008 it was truncated and converted into a siding for the storage of maintenance vehicles). Instead, passenger trains would use the former stock siding to cross other trains. In the most recent timetable (October 2013), a northbound passenger train KN62 would cross the down flour train (3938/5938 or 8938 depending on the origin of the train). On Tuesday the 17th of June, such a cross took place between Endeavour Set 3 (operating a Bomaderry to Kiama service as train number KN62) and Pacific National/Manildra Group loaded flour train 5938 (from Gunnedah to Bomaderry). At 1443, KN62 arrived alongside the platform. The driver handed the staff for the Bomaderry to Berry section to the station attendant and changed ends to the southern end of the train. At 1445, the station attendant operated the ground frame to change the points, and the driver moved his train (running as KN-3) into the stock siding. Whilst in the siding, the driver changed ends again to return to the northern end of the train. Once KN-3 was safely locked away, the points were returned to the normal position, and the station attendant returned to the platform to operate the staff instruments. Signals were then changed to permit 5938 to proceed alongside the platform at 1453 behind locomotives 8124, 8175 and 8164. The second person on 8124 handed the staff for the Kiama to Berry section to the station attendant, and received the staff for the Berry to Bomaderry section. Once again the staff instruments were operated and a new staff for the Berry to Kiama section was released. The ground frame was operated to permit the Endeavour to move back to the platform (now running as KN64) at 1501. With the new staff for the Berry to Kiama section on-board, KN64 was able to depart for Kiama. 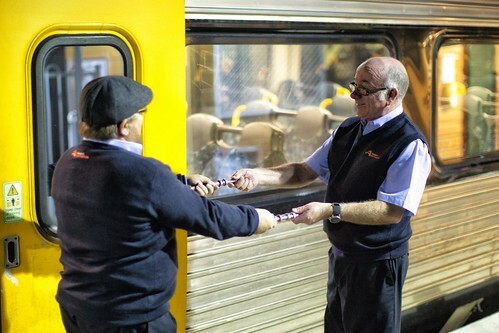 The driver of the last regular passenger train to operate in NSW under Miniature Electric Train Staff exchanges staffs at Berry with the station attendant. The last regular passenger train to operate under MES in NSW would be CN90. Once again formed by Endeavour Set 3 (only one Endeavour is allocated to Kiama to Bomaderry workings on any given day), CN90 arrived at Berry at 2220, greeted by the station attendant and a group of enthusiasts. Much to the amusement of all concerned (including the two passengers on board), shutters clicked and whirred and flashes popped to record the historical exchanging of the staffs between the NSW TrainLink driver and station attendant. Both reacted in good humour to the attention, smiling, laughing and even offering to pose for photos. With this ritual conducted for the last time, the guard closed the doors and gave the right-away bell, and CN90 departed. With passenger services finished for the evening, two freight services still needed to traverse the section prior to the possession commencing at 0200. The first of these trains would be Pacific National freight 9137* consisting of empty flour and grain hoppers from Bomaderry to Enfield (later to form 9537 to Gunnedah). Hauled by solo 8175 making light work of a short train, 9137 paused to exchange the staffs at Berry at 2345, departing northbound at 2346. With the departure of 9137, no further up journeys would be made through the section under MES. The final train to operate under the MES system of safeworking between Kiama and Bomaderry was Pacific National freight 3930, a loaded grain train from Harden to Bomaderry. Hauled by locomotives 8158 and 8119, the staffs were exchanged for the final time at 0144 on Wednesday, June 18. 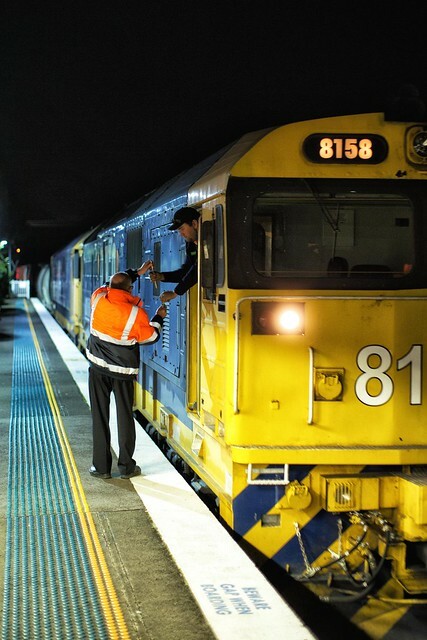 Sixteen minutes later at 0200, Sydney Trains staff implemented a possession between Bombo and Bomaderry, with the MES instruments booked out of use. PSW was implemented to replace MES until RVD could be commissioned less than a week later. The final staff exchange at Berry between station staff and rail traffic was with 8158 heading up 3930 loaded grain to Bomaderry. These works would include the provision of a local signalling panel at Berry, with the semaphore signals to be replaced by colour light LED signals. The semaphore signals would be removed, and non-stopping trains would no longer be required to stop at Berry for safeworking duties. Another piece of working history had passed into memory. With thanks to all of the staff and train crew involved on the “last day” for their tolerance and good humour, and thanks to Dean Jones for supplying some interesting background information on MES working in the Illawarra region. Thanks to the members of Railpage Australia for background information on MES working around NSW. *This train number is somewhat of an oddity, as regular readers of Trackside would know – typically, an up train will show an even number as the final digit. In the opinion of the author, this oddity has come about due to the altering of the normal number, being 9537. The odd train number could be a result of an earlier numbering system where trains working through Sydney and therefore changing from up to down were given one number for the whole trip. I understand Western coal trains to Port Kembla were some affected. However I believe they appended up or down to their number where appropriate. Thanks for recording this bit of history, I remember seeing the staff being changed ‘on the fly’ at many locations. I have fond memories of staff workings on the Richmond line up until the upgrades that came with electrification. As for the strange train number, this is true for the “through” flour trains (5938/9537, 8938/9837 and 3938/9397) which can be both up and down trains in one trip. Traditionally services terminating in Sydney have the correct odd/even number, which is why I suspect you might be right – 9137 is really a through flour service that is going to shunt at Enfield, and will have formed 1837/1337/1537 after this. Staff workings on the Richmond Line would have been something to see! It’s hard to reconcile todays operations on that line with old photos – almost an all Waratah roster! Yes the Richmond line was something special in those days. It seemed like it ran independently of the rest of the system. As long as the connection was made with the electrics at Riverstone no one cared what happened. Probably wasn’t the case but looked that way to a regular passenger like me. Thank you for sharing this bit of history with me. It was really interesting to read on how this is done.Great shots from this last day.